There are many ways to define the term marketing. But perhaps the simplest is the way presenter Jonathan Wells described it at NCTA’s Marketing Workshop for Translators and Interpreters: marketing is connecting buyers and sellers. Some 25 NCTA members attended this well-organized seminar on March 10th in San Francisco in order to find out how to identify those buyers and then sell their services to them. In his presentation, Jonathan, a freelance marketing and technology consultant with Lumera Corporation, covered the basics of marketing principles and their general applicability to T&I businesses. In a broader sense, marketing involves many variables in order to make that buyer-seller connection. In addition to the critical elements of price, quality, and timeliness, the discipline also incorporates seemingly peripheral issues such as the way you answer the phone, the look of your stationery, your appearance, and even your demeanor. Dispelling some common myths about marketing—that it’s advertising (advertising is only one component of marketing), complicated, or the same for everyone—Jonathan explained the differences between product-focused marketing (essentially selling what you have) and market-focused marketing (selling what your customers want). In both cases, you need to identify your target customers, understand their needs and wants—including price, accuracy, turnaround time, project management, and support of subcontractors—and tailor your services to them. Jonathan addressed several documents that related to T&I businesses, among them the marketing plan and the resumé. The basics of a traditional marketing plan were discussed, but Jonathan was skeptical of the document’s utility in the T&I realm. He showed great enthusiasm for the resumé, however, whose role is not so much to secure the job, but rather to secure the interview. In addition to these marketing vehicles, Jonathan also touched on a variety of other means of communication that could support the translator’s or interpreter’s outreach efforts, including websites, email, networking, and contributions to publications, the latter having particular benefit. (Potential contributors to Translorial, take note!). Timing is everything. Such was the thought that occupied my mind throughout this workshop. That is, I couldn’t help but envy the new NCTA members who attended and got a wealth of information even before learning their way to the restroom. Not that the rest of us didn’t get the same golden package, but the new members were even luckier. Jacki Noh, Michael Schubert, and Karl Kaussen led the session. Jacki Noh talked of the different aspects of interpreting: modes (consecutive, simultaneous, and sight translation) and types (community and conference). She stressed that since certification is mandatory for many interpreting assignments, it’s important that interpreters become certified. Michael Schubert presented his view of the accomplished translator as the possessor of three skills—language, computer, and business—and suggested that most candidates who fail the ATA certification exam do so because they take it prematurely. Karl Kaussen offered his perspective from the hiring side of the equation. Although professionals from abroad accept rates lower than what their U.S. counterparts usually charge, there is a downside to that; namely, their less-than-ideal command of the English language. Therefore, a solid competence in both source and target languages is an advantage that the professional can capitalize on. Alternatively, an able translator charging 10-12 cents a word may consider offering editing services (3 cents a word). It has probably happened to you, too. A total stranger strikes up a conversation with you in a supermarket and then hands you a business card and takes your card. Later he or she calls and offers to discuss a new business possibility over a cup of coffee. When total strangers all of a sudden become friendly in America, they are usually trying to sell you something. In Europe or Japan, nobody gets friendly with total strangers for any reason whatsoever. In Germany, I think they actually have a law against that sort of thing. Depending on what you look like, it could be a sexual predator or perhaps just a lonely heart trying to pick you up. But if you look like me, the chances are you just met another specimen of a fairly recent American phenomenon: a freelance representative of a multilevel marketing organization such as Amway or Melaleuca-a company that is in the business of taking business away from department stores and channeling it through friendly total strangers lurking and picking up their prey in places like bookstores, coffee shops and supermarkets. Being a curious person by nature, I sometimes talk to strangers who become suspiciously friendly in such places, as long as these places are well lit and there are other people around. The person who gave me his card and took mine later called and mailed a tape describing the philosophy of “network marketing.” It was the usual kind of pep talk describing how you can become your own boss and make big bucks if you will only make the decision TODAY AND BUY THE PROGRAM FROM THEM NOW! But the tape was quite interesting because it listed the reasons why direct marketing (selling products and services directly through a network of friends and acquaintances and finding new ”converts,” all of which pays you dividends) is the best business for our time. These direct marketing networks are becoming popular because they do work, and a lot of people have been able to quit their boring jobs and become freelance multilevel marketing representatives. I should have been taking notes, because I don’t have the tape any more (you have to return it or pay for it). But I believe the points made by this preacher of the multilevel marketing religion are directly applicable to our business – translation – and I will try to make some comparisons. Leaving aside the point that it is probably not very healthy or good for your social life to look at everybody you meet as a potential customer that you can make profit from once you, convert him or her to your “faith,” let’s consider some of the points on the tape and compare them to the translation business. 1. Multilevel marketing is the perfect business for our time because you don’t need a lot of capital to get started. True. This is true also of translation, whether you are a translator or an agency. You can get a cheap computer, an old fax and a couple of dictionaries for a few hundred dollars, and you’re in business. A cab driver’s medallion, on the other hand, costs the equivalent of a rundown shack in a dangerous part of San Francisco or a nice four-bedroom house in an uppity neighborhood in Santa Rosa. 2. Multilevel marketing is the perfect business because you don’t need any Inventory, storage area or a complicated billing and shipping system. This also applies to translation. You can store files on your hard disk, write invoices with your word processor and work out of a spare bedroom, as long as you can figure out how to get your wife and kids out of the house during the day. (Dogs, cats, guinea pigs, and other pets can stay. They are actually very conducive to achieving the perfect mental balance needed to deliver the highest quality of your intellectual product). 3. Multilevel marketing is the perfect business for our time because the whole world is your market. This is even truer of translation because, unlike products, files containing a translation can be easily and inexpensively e-mailed to your customers anywhere. A net plus for translators, who can forget about export regulations and taxes and so on. I am sure there are a lot of bureaucrats out there who would love to impose taxes on translators in addition to income taxes, but first they have to figure out how to do it. Since both technology and lawyers, who would also have to pay more taxes if these bureaucrats had their way, are on our side, we are probably in good shape, at least for the time being. 4. You can get started slowly, doing it part-time at first and then full-time once you have enough customers. This, too, applies whether you are a multilevel marketer or a translator. So far so good: all the positives that apply to them seem to apply to us too, even more so. 5. Multilevel marketing is the perfect business for our time because anybody can do it. Wait a minute! I’m not sure it’s true that anybody can sell anything. Probably not. But even if it were true, would it be a good thing? Hamburger flippers are paid minimum wage because anybody can flip burgers. All you need is two hands. In today’s labor market, one hand will probably do. A big problem in our profession is the perception among the general public that anybody can also translate or interpret as long as he or she knows two languages (or says so). If you want (to cut somebody’s hair, you have to go through hundreds of hours of training and pass a difficult examination, and only then will you be granted a license, renewable yearly on payment of a license fee, to perform this complicated and apparently dangerous operation. Obviously, some people can translate and some cannot, even though they may think they can. True, if they are not very good, they will not last very long. But it is both a good thing and a bad thing that our business is largely unregulated. It is not a good thing that translation is not thought of as a profession that should be studied in specialized courses at universities so as to create a general standard by which all translators could be judged. 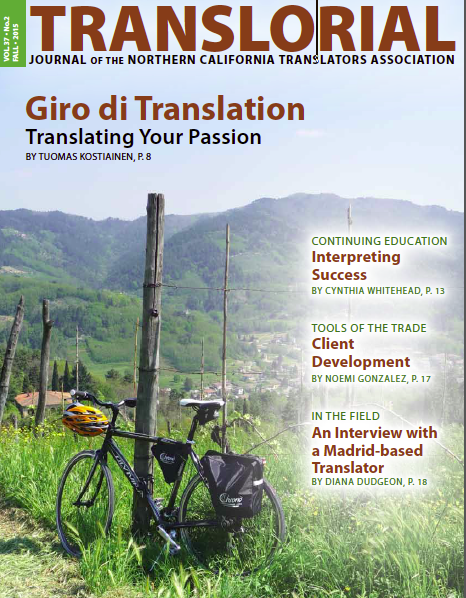 Very few consumers of our services realize what is really involved in the translation process. They do not realize that a good translator must be a capable linguist as well as a talented actor who can talk like a patent attorney one day, a car mechanic the next, and a French city hall bureaucrat from 1864 the day after that, depending on what needs to be translated. Translation is a perfect business, for our time for educated people who know how to write, who enjoy playing different demanding roles on a daily basis, and who are not afraid to face the unpredictable and confusing world waiting for them on the other end of the phone line, fax line, or Internet mail box. Anybody can get into the business of translation, but only a very few people can do it well. It is up to us to change the notion that translation is an easy process in which one word is replaced by another, a process that can be mastered by a bilingual secretary who can also answer the phone and serve coffee. If we can change the prevalent notions about our profession, perhaps one day translators-the good ones, anyway-will make as much as, or more than, professionals in other fields with a similar level of education and dedication to their work. I happen to think the best business and the best work for you or me is the kind of business and work that only a few people can do well. Ours is a strange job requiring rare skills. The example that somehow comes to mind is the example of a “medium” who enables communication between different worlds as we enable communication between different languages. The world is full of people who claim to be “mediums” that can communicate with the dead. But how many of these would-be communicators with the nether world have actually talked to Elvis recently? Do you remember the scene from the movie “Ghost” in which Whoopi Goldberg reluctantly “gave her body” to Patrick Swayze so that he could, for one last time, dance with Demi Moore to the music of “Unchained Melody”? (“Oh, my love, my darling, I’ve hungered for your touch, a long, lonely time …”). Whoopi was not some kind of a fame-seeking fake. She was the real thing. And, as John Lennon might have put it, a good, well-done medium is bloody rare. It hurt like hell to have a dead white guy dwell in her body, and she hated every second of it. But Whoopi had to do it because it was her job and nobody else could see the ghost and talk to him. She could not let the guy down just because he was white and dead! It hurts sometimes to let an author of a medical paper on hemorrhoids in Japanese or German talk through us to an American doctor. All those names of exotic herbs that don’t seem to exist in any dictionary known to man. All those names of medical conditions that seem to be too abhorrent even for Steadman’s, Dorland’s, and Mosby’s dictionary to list them. (Check our Mosby’s Medical Dictionary for nurses if you want to see some really stomach-turning pictures. Publishers of medical dictionaries seem to save the really scary stuff for nurses.) But sometimes, when no other medium is available to do the reading in Japanese and the writing in English, certainly not a medium of Whoopi’s stature, we have to do it. A good translator is somebody who has the personality to provide the spark needed to convey the message from one language into another, to drive the ideas along without jamming up the information pipeline. And we do it, even though it hurts sometimes, hopefully not just for the money. Let’s face it; we do it because we love being the medium, even when it hurts. We must be kind of masochistic that way. The best business for you is not the kind of business that anybody can do. The best work for you is the kind of business that very few people can do as well as you. That is the kind of work that is best suited for you, which is why you love doing it. Because, as the Beatles put it, in the end, the love you take is equal to the love you make.